Kalesa is a horse-driven carriage used in the Philippines during the time of the Spanish occupation. But these kalesas were mostly reserved for high officials during that era. Sans Spanish rule and after all our colonisers have left, every Filipino can explore Manila in a kalesa these days amidst jeepneys, private cars and motorcycles so I got my sons and their cousins go around Manila in 2 kalesas! We started from the National Museum, THAT magnificent building at Padre Burgos Avenue which is now open for free to everyone, passed by the Rizal Park, went over Jones Bridge and MacArthur Bridge,smelled the streets of Chinatown, marvelled at the gates Intramuros and admired the well-preserved facade of the old buildings of Manila. Thanks to our amiable kalesa driver named Mang Tony, the ride was an enjoyable one with bits of information of the buildings and places we passed by. He had been doing this for several years now and he knows the area by heart. But, like many other kalesa drivers, he doesn’t own the horse and the kalesa. They rent daily and whatever remains from the rental would become their day’s profit. So, your kalesa ride is a meaningful way of revisiting the streets and lifestyle of the old Manila as well as maintaining this charm of old world transportation and contributing to somebody’s daily take-home income. The kalesa ride when starting from the National Museum is priced at P350 ($7) per 30 minutes. If you take the kalesa from Intramuros (colonial Manila’s “The Walled City”), the rate is at P500 ($10) per 30 minutes. Why the difference? Well, practical reason. There are more tourists in Intramuros than at the National Museum but you get the same route and the same service. So, as soon as we came out of the National Museum, I noticed the kalesas waiting right in front of the Museum of the Filipino People (also known as the Museum of Anthropology). The 2 horses trotted their way along Rizal Park where the Rizal Monument stands. A little farther, the kind Mang Tony pointed to us to the spot where the national hero was shot dead through firing squad. I looked at the Manila street with a new perspective: 1) as a Mom eager to show the old Manila to my sons and their cousins; 2) as a Filipino, because even I wasn’t aware of these 2 structures: The elegant Luneta Hotel and the obviously run-down Luneta Theatre that has seen better days. 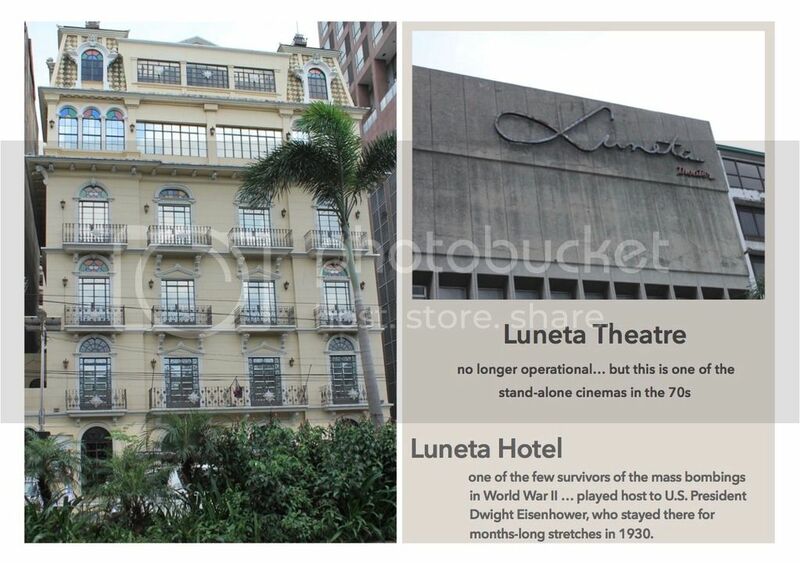 Given a chance on my next trip back home, I would love to check and get inside the Luneta Hotel. It stopped operations in the 1980s but it was restored to its former glory and reopened in 2014. The National Historical Commission played a historical marker because of its architecture and the part it played in the physical and political landscape of Old Manila. We passed by the Museo Pambata (Children’s Museum). You wouldn’t miss it along Roxas Boulevard because it is right beside the US Embassy… and there’s the statue of the King of Comedy, Dolphy. The Museo Pambata is open every Tuesdays – Sundays with a Php250/person entrance fee. When you’re in Manila, you wouldn’t miss Manila Hotel. Its halls are part of Philippine history and it had been renovated to fittingly celebrate its centennial year last 2012. This had been subject to controversy in 2014 when the Department of Public Works and Highways wanted to remove and transfer this monument to ease the Manila traffic. The plan had never pushed through since it’s still there when I took the above photo last December 2016. This wasn’t actually the original spot of the monument. It used to stand at the mouth of the Pasig River from Fort Santiago, Manila. Interestingly, despite the little known facts about Simon de Anda y Salazar, the governor-general to whom this monument was named after, he was a big part of Philippine history. He resisted the British Occupation of Manila in the 18th century. Without his resistance, the Philippines would truly have been a country colonised by the whole world! The Walled City or the “Intramuros” still gives us a glimpse of the past. The Palacio del Governador once housed the Governor-Generals during the Spanish occupation. We didn’t have a President then. The highest government leader we had was a Governor-General who reports directly to the government of Spain. This structure was destroyed by an earthquake in 1863 but was rebuilt in the 1970s to house government offices. 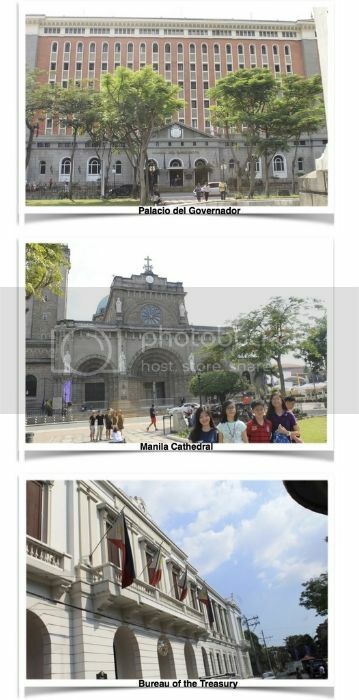 The Manila Cathedral remains as one of the top and magnificent churches in the Philippines. If you want to celebrate your wedding here, you have to book at least a year in advance. The Bureau of Treasury Building was once known as the Ayuntamiento de Manila. This was the seat of the City Council of Manila. There were still many buildings inside Intramuros but our time didn’t permit us to go through the whole place. I would love to bring my sons there again and spend an afternoon inside Fort Santiago. Though I had been there before, the feeling and the desire to show these to my sons have given me a different perspective and enthusiasm. Just outside Intramuros, the Port Area isn’t really a place you would want to be in. It’s crowded, traffic is terrible and there’s not much to do except when you have your business or office in this area. But when you think of what’s in Port Area, that’s when you realise how much businesses depend on this area. 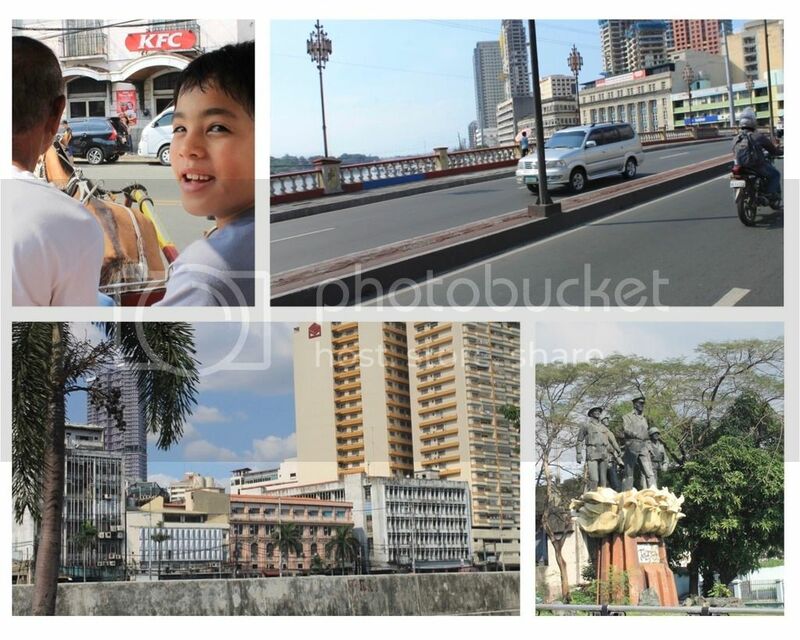 We toured Manila on a less-traffic day so the children and I had it good. We were able to ride over the Jones Bridge and the MacArthur Bridge in a matter of minutes. And there’s the Pasig River to appreciate. It ain’t bad, at all. We just need to manage traffic (humans and vehicles) and get to perk up more discipline within us to make this area more vibrant and less scary. 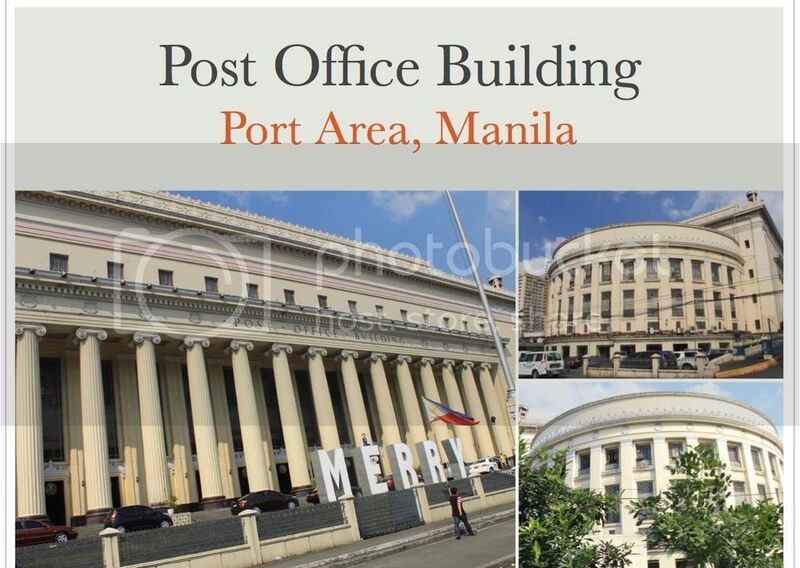 The imposing Post Office Building is a wow!It’s huge and beautiful, not the dainty-kind beautiful… but huge-kind beautiful. Man, I’m proud to bring my kids around Manila. The Philippines is not a powerful country. Its leaders, past and present, aren’t the great leaders that they ought to be . But hey, this is our only country. And yes, the children may not have Philippine-history focused subject at their international school here in Seoul but they have snippets of experiences they can load up in their memory bank and make their own interpretation of our country’s history. History, after all, is not confined to those textbooks monopolised by a number of writers whose works are also subjects of debate. This city is so rich in history! It’s sad to hear the news out of there these days as it’s certainly deterring me as a solo female traveler. Do you think it would be okay to check out once August rolls around? That’s so cool you went back and showed your growing family your heritage! Wow! What a great way to see the city or at least the tourist bits. I love it when drivers sort of become impromptu guides as well. You know they know so much, it’s nice to hear what you’re looking at along the way. Great info! I already tried this with my friends few years ago, and I had a good time. However, I think I won’t try it again because according to PETA, most of these horses suffer from respiratory ailments because they breathe in exhaust fumes, and they develop debilitating leg problems from walking on hard surfaces. Some horses have even dropped dead from heatstroke. My first thought was, what the heck is a kalesa!? loL Philippines is on my list of travels, so it was refreshing to hear a nice perspective of Manila. Thank you for sharing! Sounds like a lovely way to spend the afternoon, full of history, sightseeing and memorable moments. You’re right in saying that you kids may not be taught about certain things in the International school, that is why travel and experiencing things are fantastic for humans of all ages. I have never left the airport in Manila I didn’t realise there was so much to see and do! A super informative post with great pictures – the cathedral looks beautiful. I’ll be sure to do some exploring next time i’m there. Next time, I hope you will. Cheers! I would love to take a tour by kalesa. What a great experience for your children. It must have been a great binding moment to have. I recommend a kalesa tour. And I hope you get a good one who knows his way around so he can give you additional info.